It's time for the Salesforce #ohana to induct Sprinty the T-Rex as the 1st transgender mascot in support of #equalityforall. 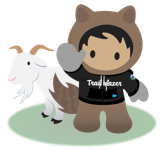 Please upvote this idea and share it on your social and Salesforce accounts! Let's also remember that Sprinty would already have a costume ready to make his appearance at Dreamforce! Some say their short arms limit thier ability to code, that doesn't appear to be a problem when they are committed to sprinting!